I hope you have a trusty controller handy, one that has all of the face buttons in good working order. You will need it with Deep Silver’s latest entry in the Sacred Universe, Sacred Citadel. A departure of sorts, Sacred Citadel is different than other games in the series. It is a brawler at its very core, one that features stat progression and customizable equipment. Oh, and local and online cooperative play. Sounds like a gem, right? Unfortunately, there are a few gameplay quirks and staying power issues with Sacred Citadel that prevent it from being the powerhouse it could have been. Sacred Citadel is a brawler in the purest sense. 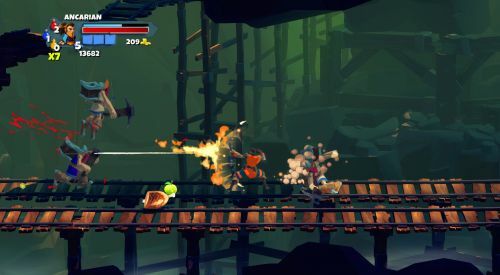 Throughout the game, you will mash your controller fervently in order to tackle the minions you come across. As you do so, you will gain experience, gold, and loot. Experience can be used to level up your character in any manner you see fit. The characters in the game are all available from the start, and include the warrior, mage, ranger, and shaman. While they all use the same base equipment (weapons and armor), they differ in the type of secondary weapon they can equip. Weapons are pretty basic, and have a raw number component along with an elemental one. Green numbers flash on the screen when comparing equipment and it is very easy for the player to see what the best piece is. As you level up, and gain better equipment and become stronger in the process. You will also learn a few new moves to add to your arsenal. While you will need to use a combination of two attack buttons and the face buttons to perform your combos, the action never becomes too difficult. You will play through act one of the game, and probably think to yourself that this game is pretty awesome. Unfortunately, once you have reached a certain point in the game early on, the fun factor starts to decline fast. The visuals portray a different landscape for each of the game’s five acts, but there is this overall feeling of sameness that permeates the game. It probably doesn’t help the fact that enemies quickly become giant punching bags. You may think at first that you are simply under-leveled for a particular zone, but then you may find that the enemies are hardly chipping away at your health as well. When played properly, it simply takes far too long to destroy regular enemies. Bosses are an exercise in patience. It takes far to long to whittle away their seemingly static health bar.